Thanks to everyone who attended my presentation at the ASQMV meeting on March 3rd. This Web page has a copy of my presentation handout slides and a link to download the “Process to Cure Boring Technical Presentations” worksheet. The three rules worksheet is a field-proven method to make your technical presentations memorable and understandable. I’ve successfully used this preparation process for years to structure presentations that make the audience care, remember, and act. The PDF worksheet file can be filled out and saved on your computer if you have a current version of the free Adobe Acrobat Reader DC. You can also print out the worksheet and write in your answers by hand. If you need help planning a presentation or would like to schedule a workshop or Webinar, visit my services page. 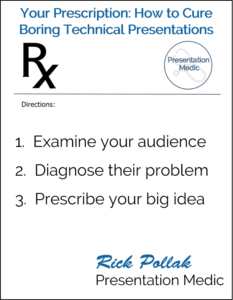 Working with the Presentation Medic may be the prescription you need to cure your boring presentations.